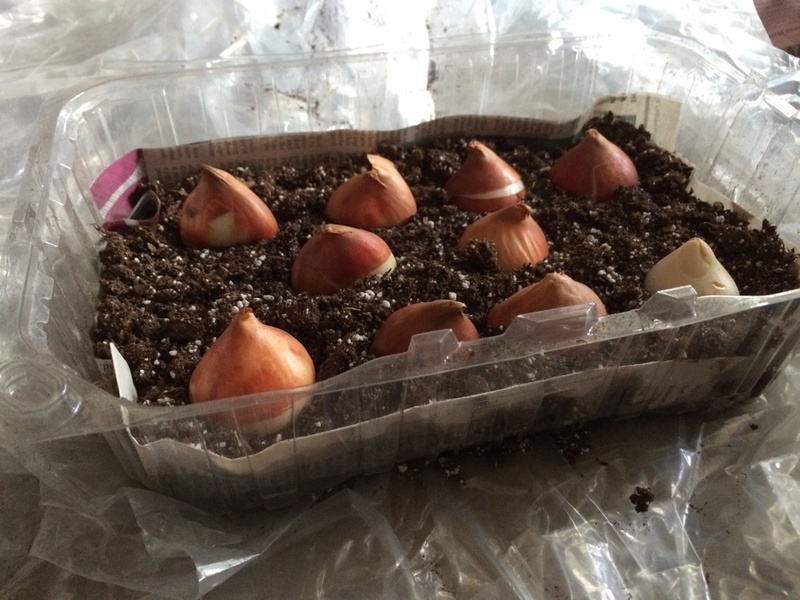 Starting the larger tray with Orange Imperial Tulips–bought in bulk so there’s no package image. I have never tried to force bulbs so this advice, cribbed from various websites, is as much for me as for you. I’m going to try some tulips, daffs, crocus and iris, maybe fritillary, and post my progress. Most spring-flowering bulbs need to be chilled for a prolonged period before they will flower. You can buy pre-chilled bulbs (pricey), or you can chill them yourselves. 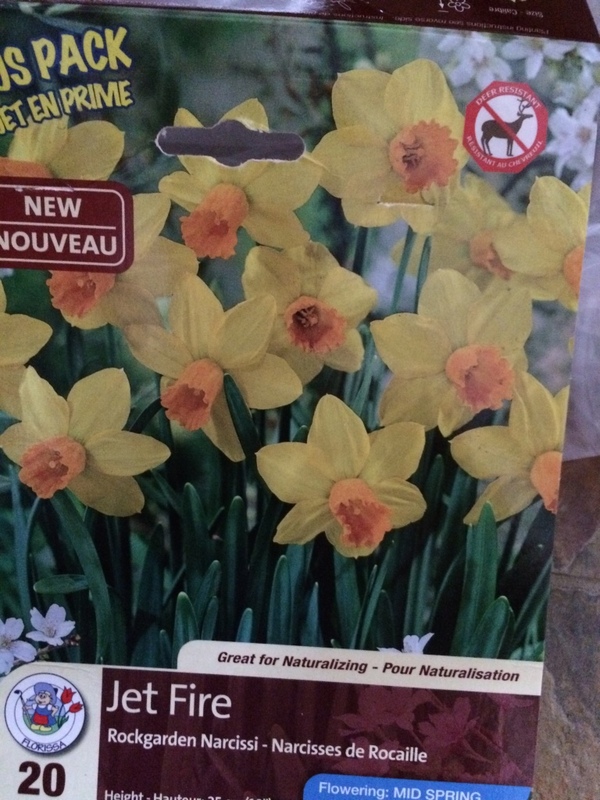 Paperwhites and Amaryllis are exceptions: Paperwhites will just start to grow as soon as you offer them some water, and Amaryllis require a whole separate blog post–maybe I’ve done one? The source of all the flower’s nutrients comes not from the soil, but from the bulb. 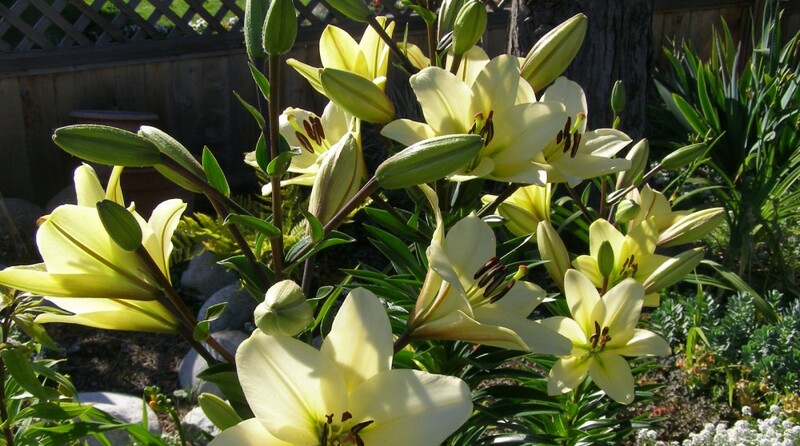 So get good plump bulbs–choosing them individually from the bulk bin may be best–and plant shallowly. The rule of planting outdoor bulbs 3-5 times the depth of the bulb doesn’t apply here. 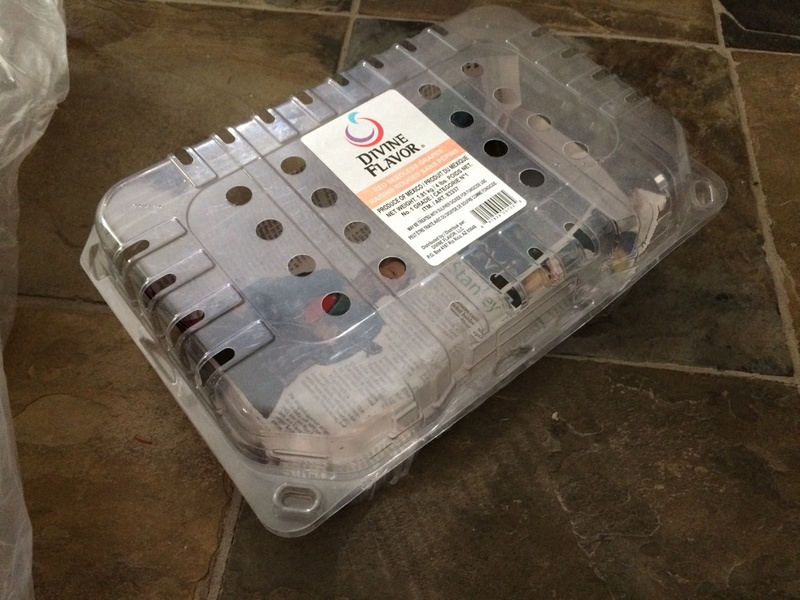 I’m using clear produce containers so I can see what the roots are doing, and they’re only about 3″ deep. Not sure what I’ll do when it’s time to actually show them. The chilling period of our common spring bulbs varies from 8 weeks for some crocuses, to (apparently up to) 20 weeks for some daffs or tulips. 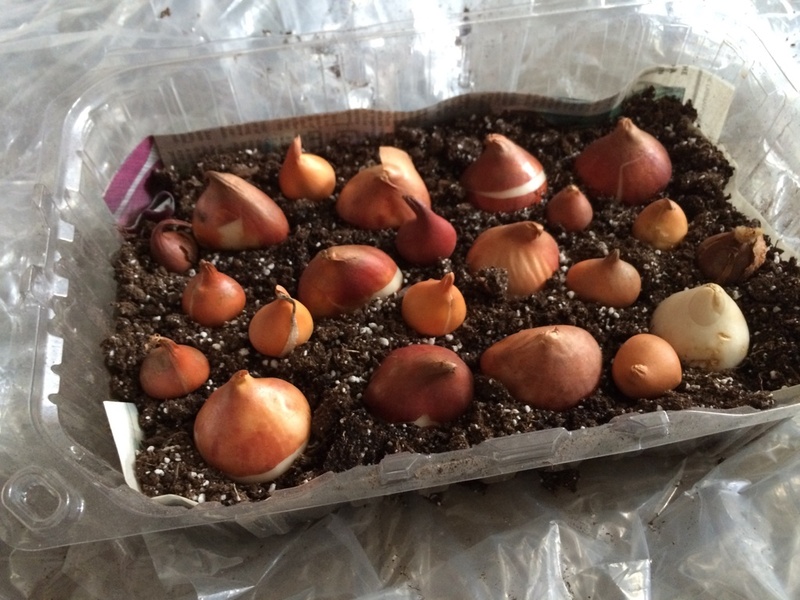 Most of the sources say to plant different bulbs separately because of their different chill times, but a longer chill time won’t harm bulbs that don’t actually need it, so I’m planting multiple types together. 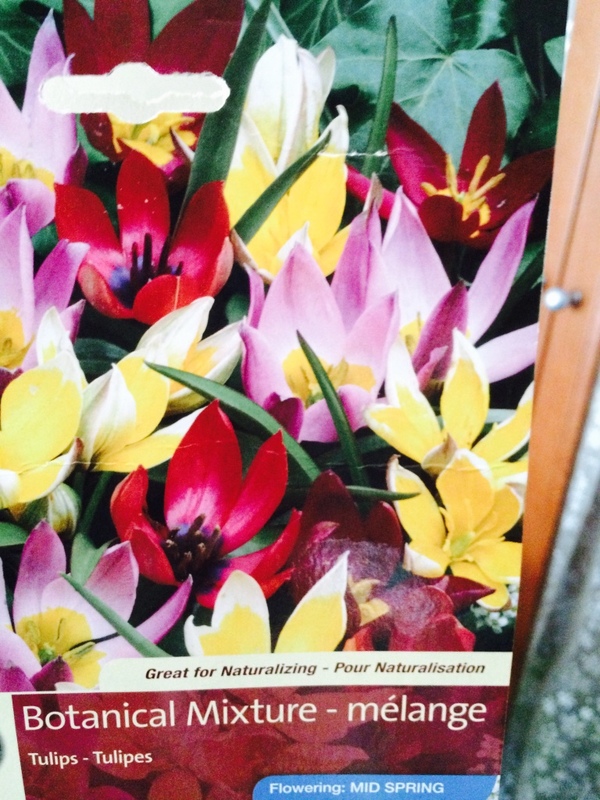 Added botanical Tulips–I’ve bought this mixture before, and ended up with about 100% pink. Oh, and the chilling temperature: fridge temp–around 4-8° C (38-45 º F). Mine are going into the fridge for most of the chilling period, but when outdoor temps get to the target range, I’ll put them outdoors on the back porch. Freeing up fridge space again. The flat side of the tulip bulb should be placed next to the rim of the pot since the largest leaf will always emerge and grow on that side, producing a more desirable looking pot. You can see in the top picture I didn’t do that… Next time. Now here’s the trick: when do you want your flowers to bloom? At a typical, or maybe just a bit earlier than typical, Spring time? Or Christmas? 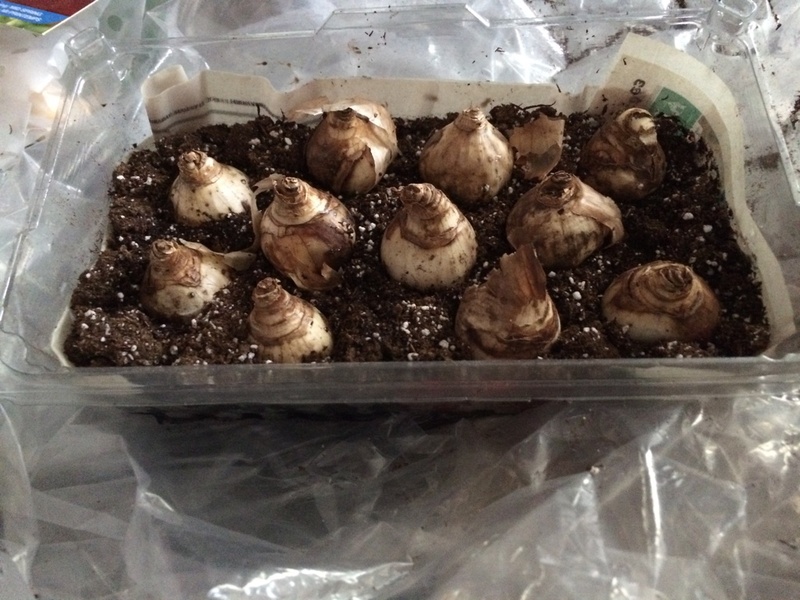 Since you can easily get an Amaryllis or Paperwhite to bloom on command, you may want to aim for your chilled bulbs to be later than that.That’s my plan: 4 months of chilling from now, plus 2-3 weeks for growth and bud formation means I could have flowers for late January, early Feb, the very time when I really feel the need to see some green growth. When it’s time to take them out of cooling, do it slowly, putting the pot in a cool space with indirect light until you’ve got a few inches of growth–couple weeks–, and then allowing more warmth and light. Smaller tray, starting with Rock Garden mini daffs. 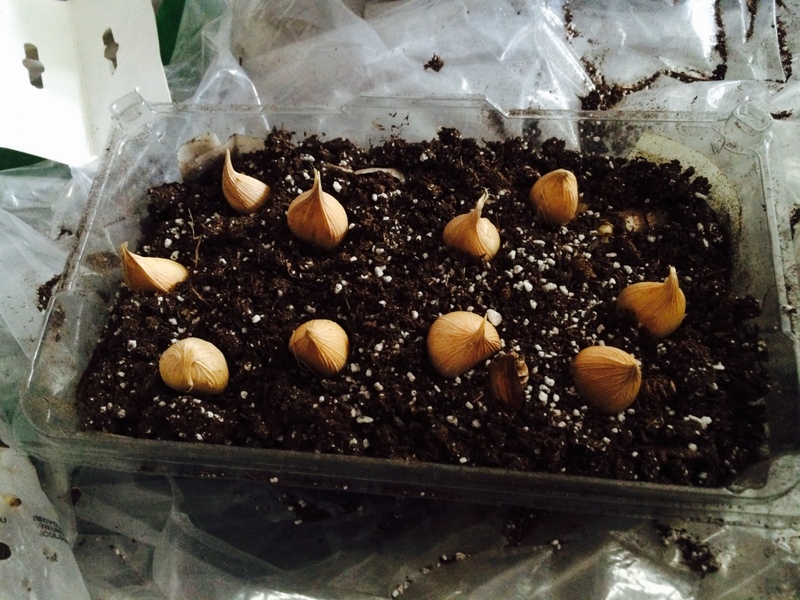 The bulbs look big to me, but they’re only half the size of something like King Alfred Daffodil. 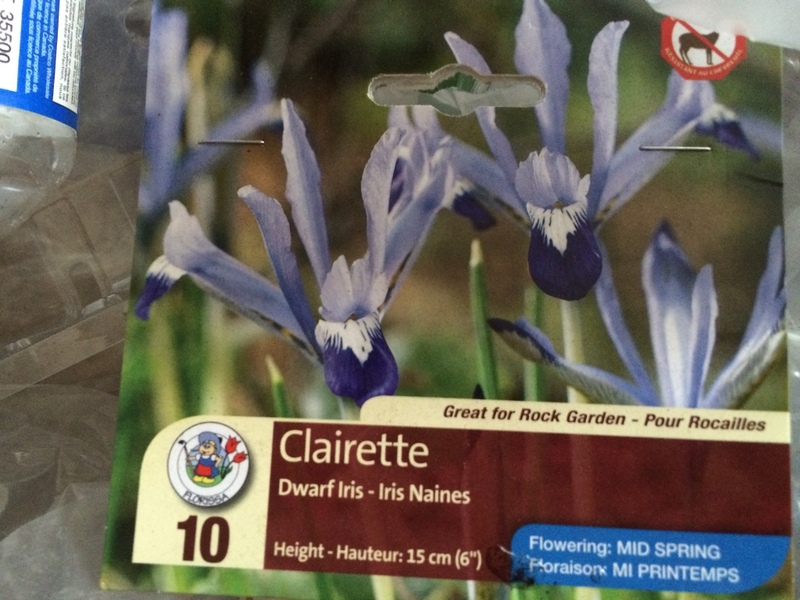 Next layer is the dwarf Iris (reticulata ?) Clairette. A new one for me. 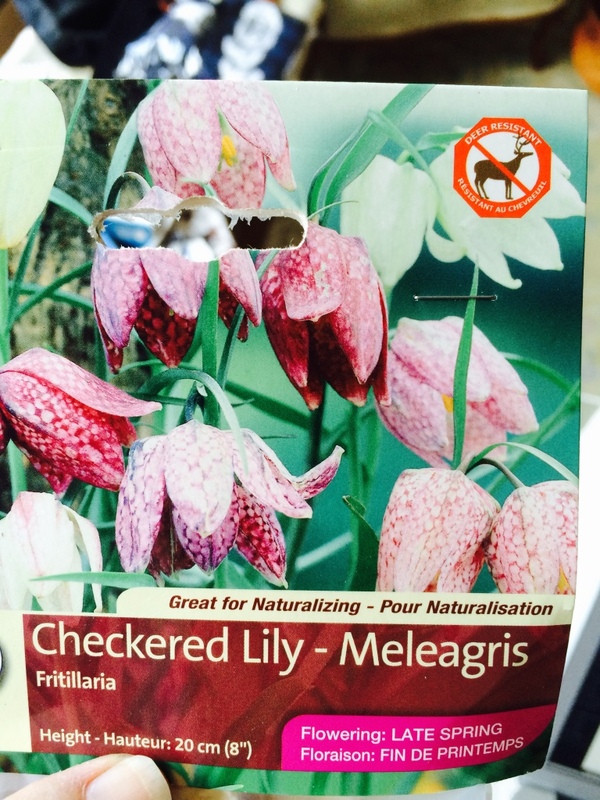 And finally a few Fritillaria meleagris–aka “Snake’s head fritillary”. Now it all goes into a bag–a loosely tied plastic bag because my trays have drainage holes, of course. Brown paper bag is recommended. I guess that would be if you have a fridge you can devote to chilling bulbs. I do not. I don’t expect to have any progress to report before Christmas, but I’ll be checking periodically to make sure the potting soil doesn’t dry out.